There’s no doubt about it: Ghost is a killer supplement brand. From the company’s online presence down to the graphics on their product labels, Ghost is a standout brand that’s likely to draw eyes at the GNC shelves. However, all that means to us is that this company has a wicked awesome marketing team. Because you know what’s more important than cool graphics? Gains. 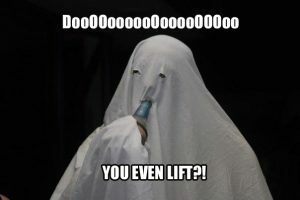 Does Ghost get the gains? …Does that sentence even make logical sense? Don’t know — we’ll need to read the Ghost Legend review to find out. GHOST Legend: The primary blend in this stack mixes the “legendary” pump enhancer L-Citrulline with other performance and pump boosting aminos. GHOST Smart Energy: In addition to pump and performance, Ghost Legend’s second blend sharpens your mental performance with caffeine and nootropics. Full Transparency: What you see is exactly what you get here. A nice change from the usual proprietary blend BS filling the supplement shelves. DO NOT EXCEED 2 SCOOPS PER DAY. Mix each scoop (serving) of GHOST LEGEND® with 6-8oz of water or beverage of choice. Start with 1 scoop or less to assess your tolerance. Consume prior to exercise on training days. Blue Raspberry: 67 mg Potassium; FD&C Blue #1. Fruit Punch: 63 mg Potassium; FD&C Red #40. So, if you’re 4 mg on the cusp of Potassium deficiency, go with Blue Raspberry. Or eat a banana and choose whatever the hell flavor you want. 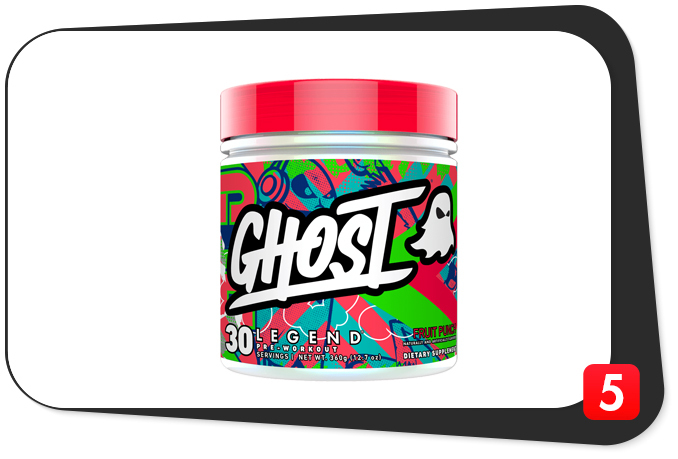 Ghost Legend stacks legendary pumps with PWO energy and focus boosts. What’s perhaps the best way to #BeSeen, as Ghost’s branding demands? Get bigger. And one of the best ways to get bigger is to load your system with muscle pumping nitric oxide boosts. How this works: PWO N.O. boosters increase nitric oxide production, in turn relaxing blood vessels for better blood flow and “pump.” That nice, hot, skin-bulging feeling that follows a heavy set of curls? That’s a pump. Okay, but how does this work HERE? L-Citrulline – While L-arginine might be the more identifiable N.O. booster, L-citrulline seems to be the better “pump” option. Not only does L-citrulline convert to arginine once absorbed but it can be absorbed, whereas L-arginine supplements seem to have a harder time. The result: better blood flow throughout the body, increasing your muscular stamina and energy production. CarnoSyn® Beta-Alanine – This beta amino acid buffers muscular carnosine levels — hence CarnoSyn®. What’s the sports benefit of carnine? Essentially, a reduction in muscle fatigue during high intense training. If this is your first time supplementing beta-alanine, fear not the “beta tingles”: the feeling that cold needles are poking your face, ears, etc. This simply means the amino is working. Agmatine Sulfate – Derived from arginine, agmatine seems better classified as a nitric oxide regulator rather than a straight up booster. Ideally, agmatine preserves the N.O. benefits of citrulline here, yet prevents the negative effects of excess N.O. damages. Some sources value agmatine for its pain reduction effects, potentially making weight-lifting a less mentally arduous experience. Norvaline – Sort of a rare, yet awesome, PWO ingredient. Norvaline seems to break the “glass ceiling” on N.O. activity by inhibiting arginase, an enzyme that limits N.O. production. Essentially, norvaline enhances Ghost Legend’s muscle pump potential. Caffeine – The world’s favorite stimulant drug and a decent fat burner. DiCaffeine Malate – Supplying an additional 37 mg caffeine for 202 mg total. 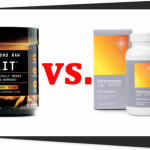 Naturally, the caffeine plus theobromine combo will get you amped. But what has us personally amped are the Alpha-GPC and Rhodiola Rosea that accompany this energy. Alpha-GPC is a notable cholinergic nootropic, with additional neuromuscular benefits, whereas Rhodiola Rosea is a fan favorite strength enhancing adaptogen herb. Very smart additions. The remaining ingredients: Olive Leaf Extract, NADH, and Rauwolfia vomitoria — interesting choices. The former two ingredients provide general health and cognitive improvements, whereas Rauwolfia seems to improve mood and behavioral issues. Perhaps making the feel-goods in this formula feel that much, uhm… gooder. At the least, it may help you finally approach that gym-babe who’s been sharing the same exercise schedule as you for the past six months. No Proprietary Blends – All dosages are ironically* visible (*because “ghost”..). Hefty Scoop Servings – Most of the dosages look thicc and chunky. 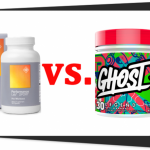 Awesome Flavors – Ghost supplements nail their flavors. Personally, this reviewer gets annoyed when product reviews place too much emphasis on how a product tastes. If it works, it works — right? 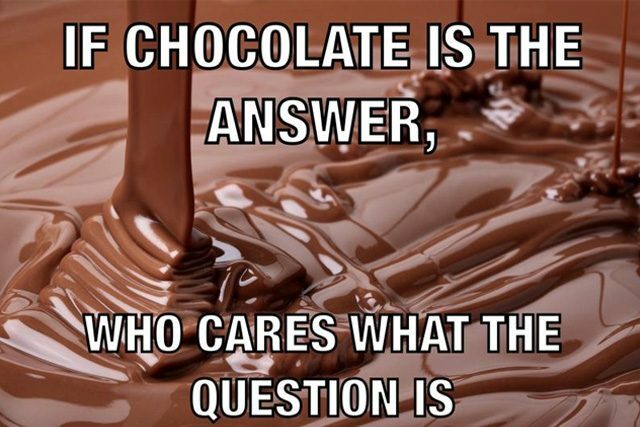 Who cares how it tastes?? But Ghost supplements taste damn good. (For example, the Ghost Whey Protein “Peanut Butter Cereal Milk” tastes so good, I’m excited to workout just to get that Peanut Butter Crunchesque flavor all over the inside of my mouth.) And despite the generic fruity flavors in Ghost Legend’s case, this pre-workout is no exception. However, it isn’t simply that this PWO tastes good: it works. And that’s something that’s made apparent with each hefty serving: you can taste the thick N.O. boosters in this supplement, and you can feel the caffeinated muscle pumps moments after. And thanks to Taurine and the other nootropics, the energy rush isn’t so extreme that you’re unable to focus. Ghost Legend supplies hard-hitting pumps with a smooth exercise energy experience. Yet, even with its flaws, Ghost Legend is an awesome PWO stack, perfect for the intense training bodybuilder and athletes. Ghost coming in sassy AF with that product description. Although, we can appreciate the straightforwardness: this definitely beats the unsubstantiated, fluffy “extreme-O” language of many pre-workout supplements. 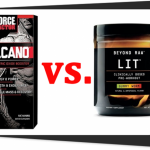 So, instead, here are our Best5 benefit claims for Ghost Legend: hard-hitting muscle pumps, tingly performance boosts, and nootropic focus enhancement. Ghost Legend claims to pack “more than 2x of the stuff you care about most into every scoop” — which largely depends on “what you care about most” — yet, if the N.O. boosters are what they’re primarily referring to, then yes: the pumps here are goooood. Bodybuilders. EDM Artists. Australian DJs. The Ghost Ambassadors include an international coterie of fit, good-looking athletes and artists. Essentially today’s ripped cool kids on the squat racks. Although, Ghost Legend’s emphasis on pumps should also appeal to the more traditional Schwarzenegger beefheads. Nothing too intense. Some customer reviews complained about there being too much caffeine, which is something to consider if you’re: A) stimulant sensitive, or B) consuming plenty enough caffeine as is. But on the whole Ghost Legend uses generally safe and natural PWO ingredients. Hefty Pumps. Nothing disappoints more than weak pumps. These pumps are good. Quality Extracts. Ghost Legend stacks some premium, potent extracts here. Transparent. Props to Ghost for eschewing the proprietary blend BS. Affordable. The price per value on those scoops sets a nice bang:buck ratio. Da Herbs. Namely Rhodiola and Rauwolfia, which need better dosages. Caffeine. Not a “Con” for everyone, yet many consumers like to supplement their caffeine separately for better caffeine intake regulation. You can buy Ghost Legend through GNC, often at a discounted price. Buying through the Ghost Lifestyle website sets up a reward points system based on your purchases. Not a bad idea, if you’re a frequent Ghost buyer. There are various types of PWO supplements. Ghost Legend focuses primarily on one: N.O. Booster — and does so to great effect. 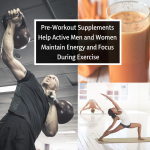 Furthermore, these guys have stacked a smart, slightly nootropic source of physical and mental energy to help push those pumps to the next level. Definitely a solid stack option to add to your workout supplement regimen.